In observation of HIV/AIDS Awareness Month 2016, the International Museum of Surgical Science has organized screenings in its art galleries that address the impact of HIV/AIDS on women and communities of color. Sampled from the wide breadth of related video art produced at the height of the AIDS Crisis, Ellen Spiro’s (In)Visible Women and Marlon Riggs’ No Regrets present unique accounts of living and loving with AIDS in a America. The Museum will also screen COMPULSIVE PRACTICE (presented by Visual AIDS) in observation of the 2016 Day With(out) Art. Ellen Spiro’s 1991 documentary records the heroic responses of three women with AIDS in the context of their respective communities. Through poetry, art, activism, and dance, they explode notions of female invisibility and complacency in the face of AIDS. (In)Visible Women was included in the Fear of Disclosure Project (1994), produced by Phil Zwickler and Jonathan Lee. Video screens on a loop during open hours. In Marlon Riggs’ 1992 documentary, five HIV+ black, gay men speak out about their individual confrontations with AIDS through music, poetry and quiet self-disclosure, illuminating the difficult journey African-American men make in coping with the personal and social devastation of the epidemic. No Regrets was included in the Fear of Disclosure Project (1994), produced by Phil Zwickler and Jonathan Lee. Video screens on a loop during open hours. 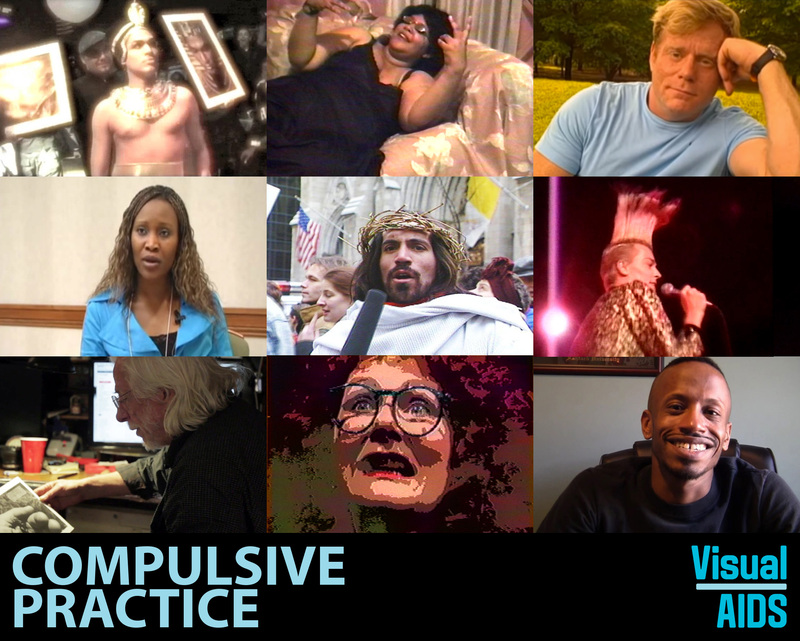 For the 2016 Day With(out) Art, Visual AIDS presents COMPULSIVE PRACTICE, a video compilation of compulsive, daily, and habitual practices by nine artists and activists who live with their cameras as one way to manage, reflect upon, and change how they are deeply affected by HIV/AIDS. This hour-long video program is distributed internationally to museums, art institutions, schools and AIDS organizations. COMPULSIVE PRACTICE is curated by Jean Carlomusto, Alexandra Juhasz, and Hugh Ryan. Participating video makers and artists include James Wentzy, Nelson Sullivan (1948-1989), Ray Navarro (1964-1990), Carol Leigh/Scarlot Harlot, Juanita Mohammed, Luna Luis Ortiz, Mark S. King, Justin B. Terry-Smith, and the Southern AIDS Living Quilt. Video screens on a loop during open hours. Image Caption: Video stills from participating artists, from top left: Luna Luis Ortiz, Juanita Muhammed, Mark S. King, Southern AIDS Living Quilt, Ray Navarro, Nelson Sullivan, James Wentzy, Carol Leigh aka Scarlot Harlot, and Justin B. Terry-Smith. This exhibition is made possible in part with support from Gilead Sciences.